Egypt felt alien from the get go. The second I got off the plane the heat hit me but I was expecting that. As soon as I entered the terminal I was immediately taken aback by the horde of taxi and transfer drivers waiting for us before we had even cleared passport control. The hall felt vibrant and energetic but also chaotic. I should have done more (some!) research but had to pay for a visa there and then. The guys were taking in money faster than they knew what to do with it and were literally chucking it under their work space. Only one stand took card though. I was relieved to see the taxi driver holding a sign with my name on it. I relaxed straight away. We walked over to his van which was just how I imagined an Egyptian taxi. We set off and I’m glad I was not driving. It was like Mario Kart. Lane discipline is non existent. There were donkeys with carts on the dual carriageway. Horns beeping constantly. Kind of fun in a scary way as a passenger. I had no idea where we were going. He could have taken me anywhere. It was very nice to see some familiar faces and sip a cool beer once I made the resort. Having woken up early and been on the plane for hours then losing two hours to a time difference made my day feel even more odd. A couple extra beers and a good burger helped matters. Day one started off with me getting locked in the apartment. Not great. By the time breakfast was done the wind was blowing. We rushed through a quick presentation then hit the water. It was fun to ride flat warm eater and test some gear. I have been working on my surfboard riding a lot this year so a twin tip was a nice change. After a late lunch the wind had died right down so i figured I would live the dream and do some work on my laptop in the beach front bar whilst sipping a cold beer. It was a nice way to work. I took a few shots then we had another quick presentation before dinner followed by sipping beers and getting attacked by moquitos till late. All in all a good day – shame I cant share most of the shots! Day two we get lucky again and it blows all day. 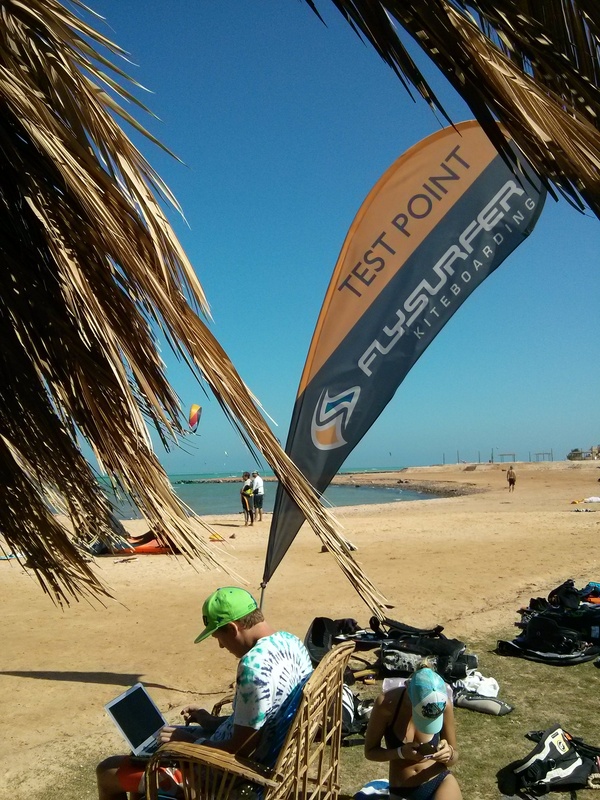 I hit the water testing a couple kites and boards. We rode till lunch then went off to eat. After lunch we chatted, talked shop then did a couple of workshops on the new models. This is where we learn about the direction the brand is headed in and where they want to go. I put together a quick edit of footage I remembered to film this day. A shower revealed I have been bitten hundreds of times and now itch like crazy. Another failure in my planning process. Bug spray is a must. I think 500 bites is a conservative estimate. Day three is a bit light on wind – still possible to ride but meetings got in the way of it. By the time those were done the wind had died. I worked on some media and we did some more workshops. Time spent with designers like this is invaluable. A late presentation (after dark with the lights on) allowed the moquitos to savage me some more. After dinner FS invited us to the beach for drinks which somehow escalated to a dodgy nightclub with every “feature” going including but not limited to a revolving dance floor (everyone loved that), foam canons, cage dancers and a very random midnight dance show. Good times. Day four was time to get the hell out of Egypt. A big lie in was much needed after a very late finish. By the time I got up there were only a few hours left until the transfer to the airport. A bite to eat, some packing and a meeting and off I went. The drive to Hurghada airport revealed the whole area to be little more than a building site. The drive was not as wild as the first one, but I did see a car going the wrong way up a dual carriageway. I cant say I am desperate to go back to Egypt – but a good time was had.